Child care in Norway: An Oslo mom on how working parents manage. In Norway, single parents have the right to more days off than parents with partners. Makes sense! We point to other countries—often ones in Europe—as models of how to do child care right. But is it really so much easier to be a working parent in Paris than it is in Peoria? We asked working moms and dads from all over the world to tell us their child care experiences. Here is the first in our occasional series. Children: Natalia, 6, and Aksel, 22 months. Hi, Else. What are your work hours? When I’m not on maternity leave, my working hours are 37½ hours per week. This is a full-time job in Norway. I have flextime, so I can work 8 a.m to 4 p.m. or 9 a.m. to 5 p.m.
Who takes care of your kids while you work? Up until roughly a year ago, our daughter went to a private day care in Oslo, which was government-sponsored (both private and public options are). You only pay about $420 per month for a full-time spot. We got a place there because she was born before Sept. 1 and we applied before March 1, and because we lived in the same building as the day care. The residents in the building got prioritized. One important thing that is quite frustrating for Norwegian families is that your child has to be born before Sept. 1 to have the right to a place in a day care in August the following year. This is the “magical deadline.” Our son was born Oct. 8, 2012, and he could not get a place until this month, at 22 months old. If couples are young and they haven’t succeeded getting pregnant “in time,” some will often wait until next year to try again. The Sept. 1 deadline has caused a problem for hospitals because there’s a big baby boom right before and in the summertime, when most of the staff have their summer vacations. There have even been stories in the media about moms with early September due dates getting cesarean sections at the end of August to reach the deadline. You have the right to extend the parental leave up to 12 months after the paid parental leave (of about one year) ends, but then the second year will be unpaid. You have to apply for day care by March 1. If you miss this deadline, even if your child is born before Sept. 1, you’ll lose your right to day care the following year. This becomes a problem if you move in the middle of the year. When I was pregnant with Aksel, we bought a house in the suburbs of Oslo in June. In our new county, we couldn’t get day care for our daughter, who was 4 years old at that time. Then we had to commute to Oslo with her in rush hour every weekday. We commuted like this for eight months, and it was totally exhausting for her. When my partner got an offer in the Netherlands, it was very easy for us to decide to leave, as we were in the middle of this commuting with no day care spot for her in sight. Why didn’t you hire a nanny instead? It is very hard to get a nanny, since that has almost disappeared from our culture, I guess because everyone has the right to day care. So it’s not like you can buy your way out of the situation if you miss either deadline. Also, the quality of Norwegian day care is very good. In my daughter’s day care they went on excursions twice a week around the city and in the woods. She learned a lot and made a lot of friends. The focus is to socialize and to play. They are also outside in all kinds of weather, which I think is very unique and good about Norway. For this reason, parents are very skeptical about nannies. We feel that day care centers are the safest places for kids. Nannies are also much more expensive than day care. (Prices vary from $650 to $1,300 per week. If the child is 12 months to 23 months, you’ll get support from the government: $976 per month when the child is 12 months to 18 months and $490 per month when the child is 18 months to 23 months.) And there are often waiting lists to get one. What happens when one of your kids is sick? Employees who have children under the age of 12 are entitled to have 10 days off in total to care for them. If you have two children under the age of 12, you have the right to 15 days off. Single parents have the right to double that amount. In reality, it can be socially hard to be away from work this much. Unfortunately, I’ve heard of parents who have given their children paracetamol to lower their fevers and sent them to day care, hoping they won’t notice. Do you live near family that can help you take care of your children? In Oslo, we lived about one hour from my parents. I often called my mom who works part time when our daughter was sick, and she drove into the city to be with her, as I tried to avoid missing work. However, many grandparents work full time, and it’s not easy for them either to take time off. Are mothers expected to be the “default parent,” which is to say, the person who misses work when the kid is sick, or who deals with school events and other organizational parenting tasks? It is not uncommon that men are home from work due to sick children. There are more mothers at school events, and mothers are probably home more with sick children, but fathers are very present as well. I would say it’s about 65 percent mothers and 35 percent fathers at a parents’ coffee afternoon in a day care at 3:30 p.m.
How long was your maternity leave? And did your husband get paternity leave? With Natalia, I had three weeks before the due date until she was 10 months old. So 11 months in total, with 80 percent of my salary. If you want a shorter parental leave, you can have that with 100 percent salary. There is a “roof” on the salary the state will cover, and it’s currently about $83,000. If you earn more than this, some employers will cover the rest of the gap for you, and some will not. What the father gets for paternity leave depends on what the mother chooses. If she chooses a shorter maternity leave with 100 percent salary, the dad will get 100 percent of his salary in his paternity leave. If the mother chooses a longer one with 80 percent of her salary, the father will get 80 percent of his salary in the paternity leave. Fathers also have the right to have time off from work when the baby is born, starting at the date of birth and for two weeks after. They don’t have the right to get paid during those two weeks, but many companies choose to give these weeks for the dad paid. In our case, Jorge got two weeks paid when Natalia was born and 10 weeks paid when I went back to work, and he had his paternity leave. That was in 2008–09; the amount of weeks have changed slightly almost every year. If both parents would wish to work very soon after the baby is born, they would not be able to find a day care that would admit children under 8 months old. Furthermore, almost no day care centers are open after 5 p.m. The regular hours are from 7 a.m. to 5 p.m.
What is your employer’s attitude toward family responsibility? In my case, my employer has been very understanding and supportive. 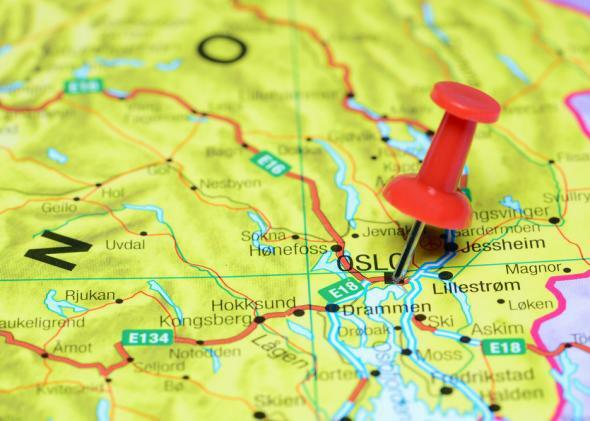 What about Norwegian employers in general? I think companies in general handle this very well. Although, I have heard bad stories about bosses saying things like, “Oh, is your child sick AGAIN? !” It’s unlikely that a boss would refuse to let you pick up a sick kid from day care because it is simply not legal. The entire society has an attitude that both parents should be working. That means that the workplace has to be flexible toward parents with young children. It is very rare that mothers choose to be stay-at-home moms, and many who do feel that they are looked down on. In Oslo, I’ve never met a stay-at-home mom.